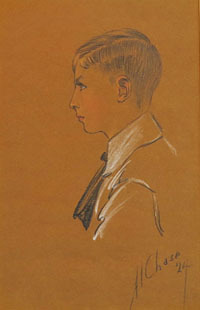 This accomplished portrait of a young boy is the work of Althea Chase, an artist who studied and exhibited at the Art Institute of Chicago in 1896 and 1897. Chase also studied in Paris with Whistler, Alphonse Mucha, and Luc-Olivier Merson. She lived and worked for a time in Pocatello, Idaho. Listed: Who Was Who in American Art, Peter Hastings Falk, editor, Sound View Press, Madison, CT, 1999---- E. Bénézit, Dictionnaire Critique et Documentaire des Peintres, Sculpteurs, Dessinateurs et Graveurs, Gründ, Paris, 1999.